You could ask why I went to see KURT COBAIN: MONTAGE OF HECK at the Sheffield Doc Fest. After all, the movie has already been shown on HBO and is widely available on DVD. But there's something about cramming into a packed screening room of fans, seeing this amazing collage of home video, diary entries, audio recordings and family photos, and hearing that amazing music turned up to 11. (Well technically 7.2). You need to see this documentary somewhere where the sound system is worthy of it, and given the sheer visual inventiveness that director Brett Morgen (THE KID STAYS IN THE PICTURE) brings to the archive material, unlike most docs, this movie really benefits from a big screen too. So the story is that Courtney Love gave Brett Morgan unrestricted access to all her archive materials, and while Morgan has created an intimate portrait of a troubled kid and a loving father, this movie is not hagiography but nor is it a hate-filled accusation. Love doesn't come out of it too well, which gives me faith that Morgan really did have full editorial control. It feels balanced, sensitive and fair. The other thing worth mentioning is that although this movie runs for well over an hour, I didn't look at my watch once. The way in which Morgan continually mixes up animated versions of Cobain's art and notes, new orchestrations of Nirvana's songs, old video and talking heads, keeps up engaged. I'm not even a Nirvana super-fan but this movie had me riveted. And if anything, I came out with even greater respect for Cobain as an artist and even more sympathy for his messed up childhood and the tragedy that both his depression and his stomach problems didn't receive the medical attention they deserved. We start off before Kurt is born with the somewhat haphazard marriage of his parents - something that is at the root of his problems. Deeply affected by his parents' divorce, his pain amplified by behavioural issues, Kurt gets passed from pillar to post. It feels like no-one really knows how to handle him and even though he wants the love and normalcy of family he lashes out at the people around him. It's just a mess - no-one and everyone is to blame, and Morgan does well to get both parents and Kurt's step-mom on film. I would've loved to see more of the father because it feels like Kurt had an almost hyper-sensitivity to humiliation that seems to stem from his father criticising him but it's hard to judge when you don't know both sides of the story. We then move through Kurt's childhood, his escape into music and pot and meet his loving first girlfriend. They split as Nirvana is on the cusp of fame and I was fascinated by this guy who was all about the music, but was also madly ambitious, and yet had such a complex relationship with the fame and money he received. To that end, we really miss interviews with Dave Grohl, who might've shed light on the interaction between Nirvana and the press, and more controversially, the nature of his relationship with Courtney, upon which fellow band-member Krist Novoselic is notably diplomatic. As for Kurt, he seems to self-destruct, and was on the verge of suicide for years, but you can't deny that there seems to have been some kind of jealous row over Courtney (nearly?) having an affair that tipped him into a suicide attempt in Rome a month before he actually killed himself. I actually like the fact that Morgan doesn't push Love further on this. There's already too much prejudice and blame thrown around. 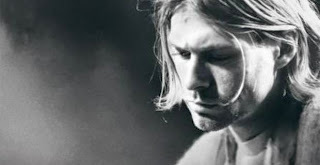 The result is a film that overwhelms us with Kurt's artistry and empathy. He's evidently a doting father and a protective husband. He's evidently a boy who needed help and love and support but didn't get it because in those days, well, even now, it's tough for parents to deal with. And yet, with all the amazing music, and those amazing drawings, I came out of the film feeling strangely uplifted and inspired by this kid with all his talent. It may sound hokey, but maybe Morgan's device of not showing or discussing the suicide really worked. At any rate, this film is really quite fantastic and absolutely worth watching, even if you aren't the biggest Nirvana fan. It's just a portrait of a messed-up lonely insecure kid who couldn't see a way out. And that's relatable, just like his lyrics. KURT COBAIN: MONTAGE OF HECK has a running time of 130 minutes. The film played Sundance, Berlin, Dublin and Sheffield 2015. It was released earlier this year in Germany, Denmark, Spain, Portugal, Estonia, the USA, Sweden, Italy, Mexico, Peru and Chile. It opens in Japan on June 27th.